The visit to Washington D.C. by Sara Wilkinson and Pat Turrell, to present our paper on The Future for Women on Surveying at the FIG International Congress in April 2002, was a great opportunity to share experience and discuss issues with female and male surveyors from around the globe. (It was also a great opportunity to see the sights!) It was so encouraging to hear of action and support for women in surveying from places as far apart as Australia and Sweden. On the other hand it was clear that barriers are still there all over the world including the USA and UK, and there is still a long and difficult road towards mainstreaming and desegregating employment. The paper presented in Washington mentioned the success achieved in winning funds for an EQUAL project aimed at combating gender segregation in the labour market (within engineering, construction, engineering and surveying sectors). Let's TWIST started our work in 1998 and now the JIVE project is picking up momentum and setting out its plans for the next three years. This new European funded national project is adopting a holistic approach e.g. little is achieved by just producing some brochures that have women in them! and two sector groups (Property Services National Training Organisation and Engineering Construction Industry Training Board). The expertise of all of these groups will be working to tackle barriers with a holistic approach as illustrated in the illustration shown. Working with stakeholders and policy makers to influence change and implement mainstreaming. If it sounds ambitious and challenging, then you probably understand what we are up against, but we have been given one of the largest EQUAL budgets in order to achieve our targets, and all partners are very excited about working on the project. Action plans and working groups and recruitment are all ongoing in order to reach our goals. If it sounds very grand and vague then get in touch with us - we have a huge range of experience and good practice to draw on to make a real difference and would be happy to give more details. That is not the only exciting news! The project has two transnational partnerships working with other groups in Europe who are also engaged in overcoming gender segregation in the labour market in similar sectors (together with IT). The first partnership is with groups in Denmark, Sweden and Finland. The second partnership is with groups in Germany and France. Both partnerships will be able to share practice and materials and work towards the mainstreaming we all keep hoping for! Sheffield is in an Objective One area and we have been successful in gaining funds from Objective One to work in construction and surveying. There is a serious shortage of skilled labour in the construction industry and there is a lot of regeneration work needed to improve the region. We are working to give choice and opportunities to women to enter and progress in the sector through short courses, upskilling courses, taster days and outreach work with communities. 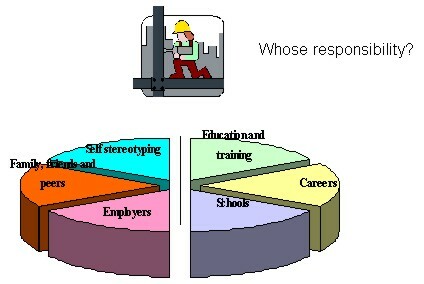 All our work is based on the model pie chart or cake shown - if we are at last to make a difference and enable women to take their rightful place in careers like surveying and construction, we cannot afford to ignore any of the slices of the pie. Dr. Clarissa Fourie has been working with FIG since 1994 to develop innovative approaches for developing countries and attended both the meetings that led to the Bogor Declaration as well as the Bathurst Declaration. She is presently an advisor to Commission 7, Working group 7.1 on customary tenure and titling and Working group 7.2 on land instruments for land distribution. She has a Ph.D in Social Anthropology in the area of change from customary to informal settlement tenure. However, she has worked on projects involving land surveyors for over 20 years, including as a Senior Lecturer in the Department (now programme) of Land Surveying at the University of Natal (Durban) for 7 years, where she ran the Land Management Msc and taught land management. When she first joined the programme, the late Professor Herman van Gysen, who courageously appointed her to a survey school, in the first week lent her a copy of Clara Greed’s ‘Surveying sisters: woman in a traditional male profession.’ At that time she was the first full time female appointment in the Faculty of Engineering at the University. She is presently an Honorary Research Associate of the University of Cape Town, Department (now programme) of Geomatics, while working full time as an international consultant in the field of land management and land administration. Clarissa has combined her research and consulting programmes to develop useful land management/administration approaches for the developing world. Some of the areas she has worked on include, the development of local government level land registration services; the role of sporadic titling in very poor countries; a spatial data infrastructure that uses both cadastral and non cadastral data as foundation data, for sub Saharan Africa and informal settlements world wide; the integration of social and technical tools to produce more viable land administration systems. She has specialised in evaluating the extent to which existing cadastral systems, or approaches to reform cadastral systems, are pro-poor. All of this work has been published in a range of international survey journals. Her consulting work has mostly been focused on Africa, but she has also worked in Indonesia, where she undertook an analysis of the institutional framework of land administration of the country, including the Departments of Land, Spatial Planning, Tax and Forests. She has also undertaken analyses for the United Nations. In 1999 she did an analysis for Habitat of the socio-technical framework world-wide in relation to tenure security and access to land, and in 1998 she undertook an evaluation of the cadastre and GIS/LIS options for Africa for the United Nations Economic Commission for Africa. She has also worked on World Bank programmes, and for donors such as Swedish aid (Sida) and British aid (Dfid). Her work in Namibia designing local land registration systems for peri-urban areas also included an assessment of the impact of the system on women. Issues such as divorce and inheritance procedures were assessed and procedures developed which supported female user options. In South Africa, appointed by the Minister of Land Affairs to represent the public, Clarissa has been a council member (and alternate) on the South African Council for Professional and Technical Surveyors since 1995. Also in the capacity of public representative, she sat on the committee transforming surveying education in South Africa, in terms of the National Qualifications Framework. The transformation process in South Africa since 1994 has meant that many more doors have been opened to women and the glass ceiling lifted, also in the survey field, which has made it possible for them to become leaders in the industry. This progressive approach in South Africa explains why Clarissa is the third South African woman to be profiled in our newsletters. That is, a country wide regulatory framework, based on constitutional imperatives, which supports affirmative action, can make an enormous difference to representivity in a country’s survey industry. 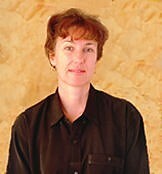 Clarissa is married to wildlife artist and author, Paul Augustinus, and they are based in Durban, South Africa. Whenever possible they go to the bush, with African rain forest safaris being top of the agenda. 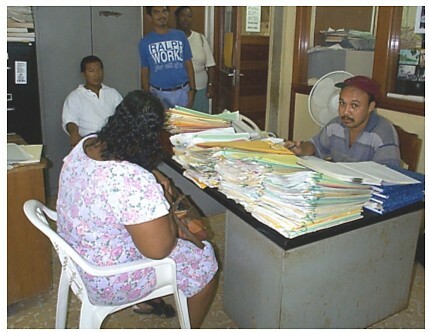 The presentation at the FIG Congress 2002 in Washington, DC was a supplement to the paper submitted to illustrate that the widespread "gender blindness" in land matters is an issue that we may all do something about, so that we as professionals at least are aware of the problems, but the complexity of rectifying the situation for the disadvantaged women of the world, where the damage has already been done, is a long struggle. It is striking that surveyors have largely been absent in research on women’s access to land (with notable exceptions), and most research on land tenure in a socio-economic context has been written by other professional groups (lawyers, economists, anthropologists, etc.). This literature is rather scattered, but there are central works, which stand out, such as works on South Asia by Bina Agarwal (1), a professor of economy, and the team of Carmen Diana Deere and Magdalena León (2), professors of agricultural economy and of sociology, respectively, authorities on land tenure in Latin America. I warmly recommend reading these authors, who capture the attention beyond the discussion of gender: By their deep insight into land reforms and land tenure they communicate the nature of the whole land tenure system, and I guarantee that even a reader without any interest in gender questions will be captured by their knowledgable accounts. I was personally astonished when coming across the phrase "dispossession of women" taking place during land registration and land reforms, even documented in cool figures. No wonder that there is inequality in the world, if property of a couple passes (often unnoticed) into the formal and unrestricted ownership of the head of the household, usually the man, and if the male heirs are ensured a better share than their sisters. Therefore the surveying profession at large has a lot to catch up with, but it is not boring. One of the dramatic "high points" of reading is the issue of the impact of family law, which in many cases places women in vulnerable and miserable positions, if they are widowed or divorced. Family law and the inheritance systems are in fact very important factors for the development of the tenure structure, in particular for fragmentation, so the topic need to be at the attention of surveyors for many reasons. It is noteworthy that the most common way for women to gain access to land is through inheritance, for which reason family law is important when discussing gender. However, formal law is one issue and the practices may be different. At first there is the practical question of the civil status of women: many live in consensual unions, so real protection should include such cases as well. In many societies there are norms against women owning land, and the distance from the formal legal system to the practices in the local area may be so large, that the formal legal system is beyond reach for women in need thereof. In all countries and areas there are variations or tensions between the formal situation, enforcement, implementation and the actual situation. Even in industrialised countries significant deviations can be found, but in few places probably as complicated as described by Rubya Mehdi in ”Gender and Property Law in Pakistan – Resources and Discourses”, 2001. Mehdi has made research on the overlay of four legal regimes (State laws, religious laws, and customay laws /practises) and its effect on households in four villages. She describes practices of law in the field of family relations with focus on property relations within the family. Mehdi shows that the woman frequently concludes that the greater potential economic security is to surrender her right of inheritance to her brothers, while the brothers do not always deliver this security. The law provides a right, but economic circumstances render that right empty. An interesting part of the gender discussion is that it is no more an isolated rights' issue, which is documented in the World Bank Policy Research Report, "Engendering Development - through Gender Equality in Rights, Resources and Voice", 2001. The chapter "Gender Inequality hinders Development" documents costs to Well Being, Productivity and Growth, and Governance. As a consequence the UN-Habitat recommends to using “women” as a primary indicator for the success of its interventions within the Global Campaign for secure tenure, considering the gender factor as one of the best monitors of changing socio-economic relations. UN-Habitat has furthermore found that, in the reduction of urban poverty, a focus on women has the most beneficial effect, and that more people are assisted out of poverty as a result of this focus, ref. to http://www.unchs.org/tenure/vision.htm. To conclude it was proposed to work towards mainstreaming of gender issues by using this knowledge and prepare new literature on land tenure, cadastre and land administration, taking into account the needs of practitioners. Participation of women in implementation. Despite the daunting tasks at hand, the power of modern communication gives reason for optimism. It has become easily accessible to network with other interest groups and share ideas and experience - as this newsletter demonstrates, all of which are essential to meeting the challenge of developing new models for land administrations and equitable access to land. (1) Bina Agarwal, "A field of one's own, Gender and land rights in South Asia", 1994. (2) C.D. Deere and M. León, "Gender, Property and Empowerment: Land, the State and the Market in Latin America", 2000.